Many of us share the sentiment of loving neutral looks, but how do you feel about all-black outfits? Personally, I adore them! Both by day and night, they look strong and yet elegant. 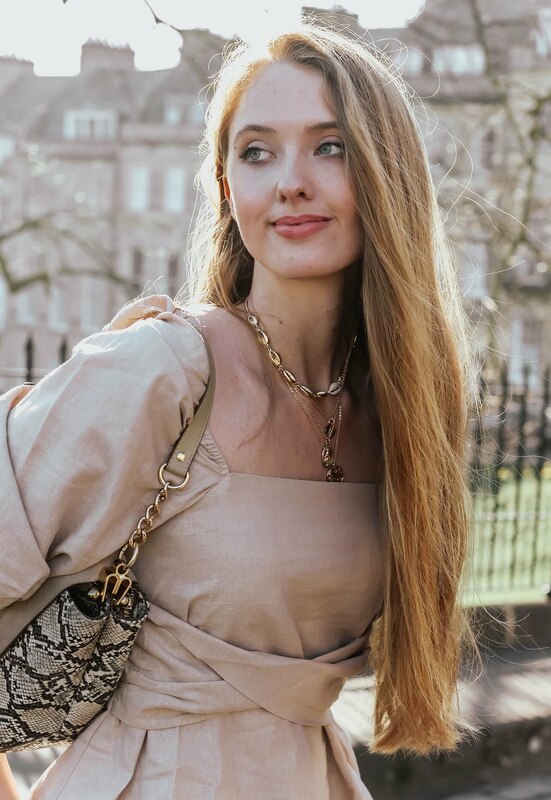 Lately, I've been applying this very same, unusual combination of 'strength meeting elegance' to accessories; going from ear cuffs to metal bangles and from dangerously high heels to statement bags. Just as the spikes on my Valentino winter purchase saw my heart race, the heavy embellishment on this mini box bag has really caught my attention! With both a shoulder strap and top handle, this box-style beauty has quickly become one of my faves; who can resist such intense embellishment?! Continuing my love for all-black outfits, I opted for a tulle skirt and cut-out shoulder knitwear. I've learnt to pretty much ignore when clothing is described as petite (in this case, ASOS Petite Exclusive Rib Body), because all it really means is go up a dress size or two. Needless to say, this doesn't apply to trousers where length is crucial, though it works perfectly with knitwear. Ah, by the way so sorry I can't point you in the direction of this tulle skirt by Navy London, I literally only bought it a couple of weeks ago and it's already sold out! Not at all surprised. I hope you're all having a lovely - though no doubt chilly - week so far. Just to quickly update you (before we all leave to curl up on our sofas in our pyjamas), there's now a shiny new 'Shop My Wardrobe' feature on my blog's homepage, making it even easier to shop the looks you see on A Glass Of Ice! I can't stop lusting over your bag Gabrielle. It's STUNNING. I can picture having it in my collection. Shame I am on a shopping ban. I think all black always look so classy and chic - the bag is just lush as well! You have so much style! That bag is so sweet! I adore all black looks. You can never go wrong with all black. This is a perfect look. It's so feminine and chic! This whole outfit is amazing. You looks stunning. The bag is so cute! I love the look of that dress, it looks gorgeous. All black outfits are definitely my kind of thing. I love all black outfits, but I usually pair them with a red lip for the ultimate power combo. What a beautiful bag and I really love the shoes too and how you've styled it all! You look so elegant in this outfit!! I personally like all-black outfits. It allows you to experiment with textures and details a bit more. I love this look you've put together. You look so stunning and elegant!! I love all black outfits especially when they include a statement bag like that! I love your skirt too, the shape is just perfect! That is such a fun bag! I think strong and elegant is the perfect way to describe all black looks, especially this one. I love that it still makes a statement while being neutral, too. Hope you have an awesome weekend! Love everything about this look. This bag is so beautiful. Love the key lock in the front. I think the bag is a touch too out there for me but I adore your skirt and heels, Gabrielle! I am in love with your whole look. That bag is so lust worthy. I like all black as long as it has some visual interest like your outfit does. That skirt is so pretty, I'm not surprised it's already sold out! And for certain clothes petite does just mean size up, although I personally won't risk it with skirts because sometimes they can be too short for me to be comfortable in them. I do wish ASOS had a way to filter your search to exclude maternity/petite/plus size though because I hate when they have exclusive styles that I really like and I can't buy them! At least you could get away with it with that top though, because it's really pretty. Beautiful! That skirt is so pretty!! Gorgeous look girl, I love that skirt so much and your bag of course <3 Love the new shop page as well, perfect ! Black on black always look classy and beautiful to me! You look very gorgeous, and I love the details of this outfit darling! I love all back outfits too. You look fabulous in this one Gabrielle. The details on the shoulders of your top bring a very unique touch, so pretty. The skirt is really beautiful and omg your shoes.. I love them, I want them, absolutely gorgeous! I adore all black outfits. There is something about them that are is so classy and elegant. You look amazing and your bag is gorgeous. You look like a doll, Gabrielle! I typically don't wear all black outfits but love how you put this look together. It's girly and classic and I love the mix of textures! That bag is also to die for! That skirt is gorgeous, no wonder it's already sold out! I love the ribbon detail! I don't wear all-black outfits too often because I feel that with my dark hair it can be a bit too much, but you certainly look amazing! I adore the way you've pulled everything together here! Each piece compliments the next and I'm obsessed by your skirt, I do love a ribbon! The bag completes the look perfectly - such a great choice! This is such a beautiful outfit! I love the skirt and the bag is so glamorous and cool! Such a timeless styling! In my opinions all black outfits are always very elegant and chic. They allow us to play with textures....With all the black stylings, everything comes down to details. Accessories become everything. You have certainly created a very feminine and ladylike look. I absolutely love that skirt! Gorgeous heels and bag as well. You look enchanting in this romantic outfit!!!! Your tulle skirt is absolutely gorgeous! I love the ribbon belt. It's a shame it's sold out already. I prefer light colours to black generally, but once in a while I'll find myself wearing an all black outfit, which I'll balance with a colourful bag or silver jewellery. Black is always a good choice though, classy and timeless! What a gorgeous outfit!! I love the bag! these are really nice pictures too, you look gorgeous! I love all black outfits too! That bag is gorgeous! I love this black on black outfit Gabrielle you look so incredibly stylish in your beautiful little black dress, heels, and your unique and funky embellished bag really finishes off the entire outfit so nicely. The fit of this dress really is ever so beautiful and love the way it flares out and nips in at your waist. These photographs are gorgeous, and love the way the outfit draws emphasis to your beautiful golden hair too. Great post and as always you look so chic! This is absolutely gorgeous - what camera do you use?? Loving the whole outfit, it's absolutely stunning and you always look so elegant and beautiful! :) The bag is just to die for - I love it! Hope you're having a lovely week hun! Wooow, this bag is lovely with the rhinestones details ! I have a big crush on everything with rhinestones. Love your black look, so chic ! When wearing black, it is so important to add texture. You've accomplished that with this outfit Gabrielle. I love that bag and your heels. Truly love the details of the bag and skirt. Adoro quella borsa e quelle scarpe...molto femminili! this is such an amazing look!! This is such a stunning look! Black suits you so well. And I love all the different textures in this outfit. I recognise the place from your Insta stories! Beautiful photography Gabrielle. While I've sworn to never wear an all black outfit, it looks beautiful on you with your natural blonde hair and perfect skin. Have a great start into the new week darling!